Unusual Heart Necklace For Women : LOVE2HAVE in the UK! 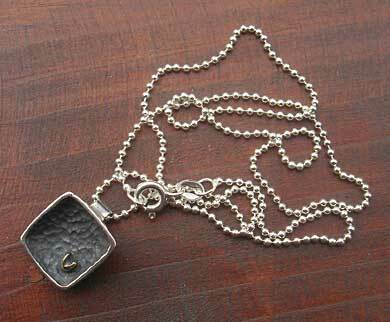 An unusual and amazing heart necklace for women in the form of a square pendant with a gold heart made from sterling silver. 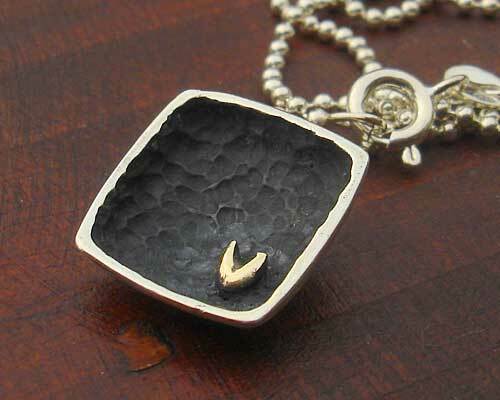 The silver comes heavily oxidised to a blackened, charred texture. 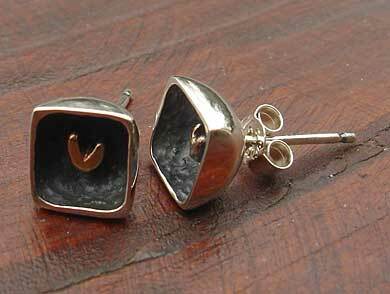 It is incredibly dark and contrasts beautifully with the natural colour silver on the rim. The oxidised surface almost looks gouged, as it comes created by hand. You can see in the photographs the picked, scooped and chipped shaping all cut by hand. The lower right-hand side of the pendant features a raised 9ct yellow gold heart; its shaping is reminiscent of a free hand shape cast into a solid. The profile of the pendant is concave featuring a rounded polished silver reverse and comes threaded onto a silver ball chain which measures about 17 inches long. The necklace is approximately 14mm square with slightly rounded corners. Matching earrings also available.